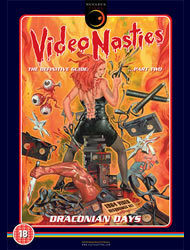 This sequel to ‘Video Nasties: The Definitive Guide‘ (which Clout PR also handled) continues the story of the most extraordinary and scandalous era in the history of British film. This beautifully packaged three-disc collector’s edition box set was released in July 2014, to tie in with the 30th Anniversary of the Video Recordings Act 1984. Clout handled all DVD release publicity.